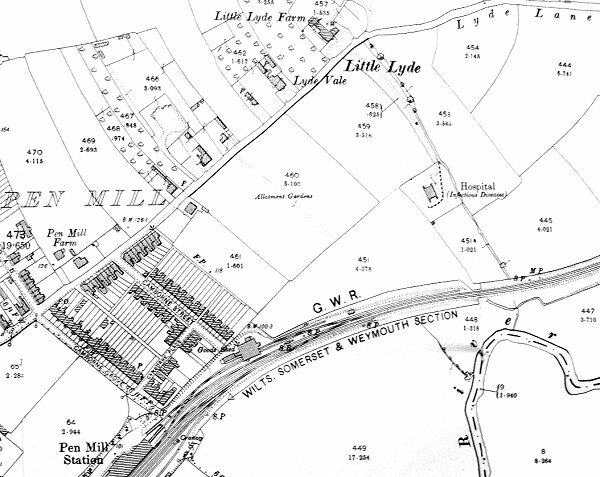 Lyde Road was originally called Lyde Lane. As seen in the 1901 Ordnance Survey map below Lyde Road, as a surfaced road, only went as far as Little Lyde, after which it veered eastwards across open fields as Lyde Lane. This situation continued until after the Second World War, as seen in the aerial photograph of Lyde Lane below. In the 1980's the Pen Mill Trading Estate was created and Vale Road was built more or less along the line of Lyde Lane. This was quickly followed by the construction of Oxford Road and Buckland Road. However a tiny section of Lyde Lane survives to this day, as shown on the current Ordnance Survey below, and is surely the only true country lane (it even has grass growing up the middle) surviving within the borough boundary of Yeovil? This aerial photograph of 1946 shows Lyde Lane running from Little Lyde Farm, at centre, across open fields as far as the railway at far right. This current Ordnance Survey shows the remnant of Lyde Lane that survives as a cul-de-sac off Vale Road on the Pen Mill Trading Estate. Lyde Lane photographed in 2013. 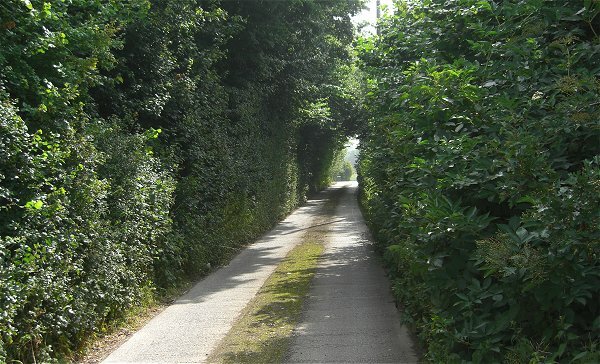 The only true country lane (it even has grass growing up the middle) surviving within the borough boundary of Yeovil?